On the American scene, 1938 was no one man's year. Certainly it was not Franklin Roosevelt's: his Purge was beaten and his party lost much of its bulge in the Congress. Secretary Hull will remember Good Neighborly 1938 as the year he crowned his trade treaty efforts with the British agreement, but history will not specially identify Mr. Hull with 1938. At year's end in Lima, his plan of Continental Solidarity for the two Americas had a few of its teeth pulled (see p. 10). His shadow fell far beyond Germany's frontiers. Small, neighboring States (Denmark, Norway, Czecho-Slovakia, Lithuania, the Balkans, Luxembourg, The Netherlands) feared to offend him. In France Nazi pressure was in part responsible for some of the post-Munich anti-democratic decrees. Fascism had intervened openly in Spain, had fostered a revolt in Brazil, was covertly aiding revolutionary movements in Rumania, Hungary, Poland, Lithuania. In Finland a foreign minister had to resign under Nazi pressure. Throughout eastern Europe after Munich the trend was toward less freedom, more dictatorship. In the U. S. alone did democracy feel itself strong enough at year's end to give Hitler his come-uppance (see p. 5). The Fascintern, with Hitler in the driver's seat, with Mussolini, Franco and the Japanese military cabal riding behind, emerged in 1938 as an international, revolutionary movement. Rant as he might against the machinations of international Communism and international Jewry, or rave as he would that he was just a Pan-German trying to get all the Germans back in one nation, Führer Hitler had himself become the world's No. 1 International Revolutionist—so much so that if the oft-predicted struggle between Fascism and Communism now takes place it will be only because two revolutionist dictators. Hitler and Stalin, are too big to let each other live in the same world. But Führer Hitler does not regard himself as a revolutionary; he has become so only by force of circumstances. Fascism has discovered that freedom—of press, speech, assembly—is a potential danger to its own security. In Fascist phraseology democracy is often coupled with Communism. The Fascist battle against freedom is often carried forward under the false slogan of "Down with Communism!" One of the chief German complaints against democratic Czechoslovakia last summer was that it was an "outpost of Communism." Read "New Hitler Exhibit Causes a Stir in Germany." 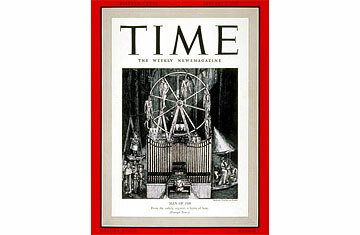 See a TIME cover story on Hitler.